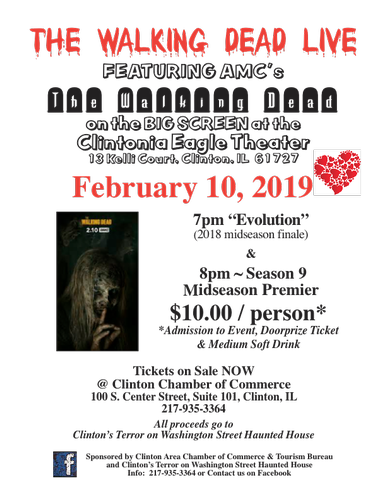 Join us at the Clintonia Eagle Theater as The Walking Dead returns with the Season 9 Midseason Premier. This event is a fundraiser for Clinton Chamber's Terror on Washington Street Haunted House. Join us for The Walking Dead Live on the BIG SCREEN! 8:00pm Season 9 Midseason Premier "Adaptation"
Cost: $10.00 / person which covers admission to event, doorprize ticket, and a medium soft drink. Tickets available at the Clinton Chamber of Commerce NOW. They will be available at the Clintonia Eagle Theater on February 10, 2019 at 6:00pm.